Frank has been in a car accident*. The doctor tells him he lost his spleen, but Frank believes he has lost more. He is missing memories – of those around him, of the history they share and of how he came to be in the crash. All he remembers is that he is a lawyer who specialises in small print**. In the wake of the accident Frank begins to piece together his former life – and his former self. But the picture that emerges, of his marriage, his family and the career he has devoted years to, is not necessarily a pretty one. Could it be that the terms and conditions by which Frank has been living are not entirely in his favour***? In the process of unravelling the knots into which his life has been tied, he learns that the devil really does live in the detail and that it’s never too late to rewrite your own destiny. I really enjoyed this quirky funny narrative – the writing was engaging, the settings and characters fully fledged and I really enjoyed the terms and conditions (self-talk) that featured on most pages. The protagonist, Frank, is bravely saying to the readers (and himself) what he cannot say out loud to whomever he happens to be conversing with. He is not brave, he is non-confrontational and he is starting to wise up to the manipulation he has been subjected to – and he doesn’t get angry (well only just a bit) he gets even; “The Terms and Conditions of Revenge: It’s best served cold (with a side serve of humiliation) (p.214) and this revenge is very well executed – it has me cheering in the background. I think there is a little bit of Frank in most people, and hopefully not too much of Oscar or Alice. A compelling, heartbreaking story of first love. 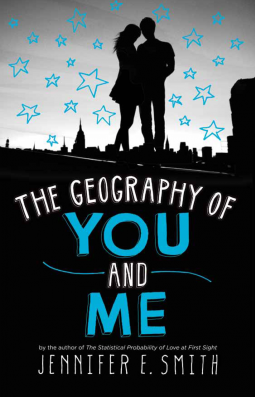 The Geography of You and Me is a story for anyone who’s ever longed to meet someone special, for anyone who’s searched for home and found it where they least expected it. A delightful and smile provoking book! This reader suggests that this is best read on a cool evening, when you are snuggled up in your warm pjs, with the quilt tucked in around you and a hot beverage and a few chocolates by your side to sustain you whilst you settle in and enjoy this read. It is so lovely to read a warm, caring, gentle and heartfelt book before bed; you go to sleep with a smile on your face! This novel is highly recommended not only for the YA reader but for all who enjoy a little romance and a happy ending now and then. This author knows how to put a smile on your face and warmth in your heart! An easy pleasant read to take on holidays, read on the bus, on the plane or like me in the caravan or read before going to sleep and you will make the end of your day glow with happiness; charming and heart-warming and who couldn’t do with a little extra love in their day? This book makes no apologies for the simple pleasure it will bring to you heart. It is what it is…cosy love story. 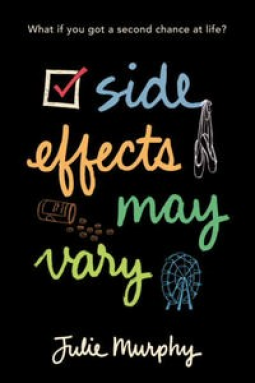 Written from the perspectives of both Harvey and Alice, in Side Effects May Vary, Julie Murphy weaves a compelling story of friendship, relationships and love, with a little bit of death thrown in for good measure; at least for a while. When sixteen-year-old Alice is diagnosed with acute lymphocytic leukemia, she vows to spend her final months righting wrongs. So she convinces her best friend Harvey, who’s loved her forever, to help with compiling a crazy ‘just-dying-to-do’ bucket list, that’s as much about revenge as it is about redemption. But just when Alice’s scores are settled, she goes into remission. Now she must face the consequences of all she’s said and done and discover just what happens when we say our ‘final’ words, only to find that life isn’t through with us yet. Sharp, witty and poignant – this is a book written for all ages. A warm and moving read about growing up, understanding what real love (not infatuation) is and facing a death sentence. This is a very readable story full of real characters and real emotions. A coming of age story with a difference – Alice thinks she has only a short while to live and therefore risks everything to boost the numbers on her score card; she becomes selfish, hard and cruel and when the death is sentence is removed she is lost and drifts like flotsam in the real world. This narrative is every parent’s worst nightmare – I am really pleased it had a happy and redemptive ending. This story told from the two teenager’s perspectives, it flows freely and realistically. The language and conversations are engaging without being self-conscious. A delight to read. This is a beautiful, poignant and haunting story. For Clara Mattingly, routine is the key to enduring the endless weeks, months and years of a life sentence in a women’s prison. The convicted murderer never looks back at who she once was—a shy young art student whose life took a sudden tragic turn. And she allows herself no hope for a better future. Survival is a day-to-day game. But when a surprise visitor shows up one day, Clara finds that in an instant everything has changed. Now she must account for the life she has led—its beauty as well as its brutality—and face the truth behind the terrible secret she has kept to herself all these years. Critically acclaimed author Rebecca Coleman brings you the haunting story of a woman’s deepest passions, darkest regrets and her unforgettable and emotional journey toward redemption. I loved every minute of this narrative; the writing is clear, clean, understated and elegant. The protagonist’s voice has a particular sense of calm and peace that I found mesmerising and very, very moving. The story itself is powerful and very sad and very relevant to the social issues and Royal Commissions that countries like Australia are trying to deal with today; this one story speaks so well for the victims of so many kinds of abuse and the voices of the characters in this book ring true and clear, they do not whine, or brashly shout out pleas for attention but quietly inform and allow the reader to peek into the lives of others less fortunate to witness the injustices themselves. There are so many levels to this very quietly spoken, moving narrative. There were times when I held back a silent tear for the inhumane treatment served up to so many caught up in the penal system – the point of a custodial sentence is to detain not to dehumanise isn’t it? All involved in this system are affected, not just those who are incarcerated. I think this point is made very clearly. Clara’s story is moving. Clara’s story is engaging, insightful and so well written – and that is the best part – the writing is so restful despite the subject matter being discussed. I loved Clara’s peaceful, calm, serene voice. This is a great read. Don’t be put off by the gentleness of the words, this is a great story, this is a powerful story of redemption and hopes told by voice that does not preach to or admonish the audience. 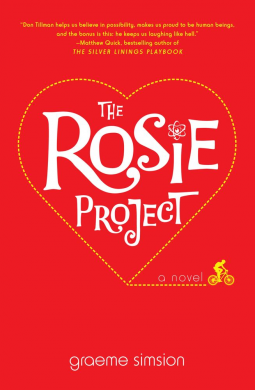 A hilarious, light hearted feel good book (I also most said movie…I am sure that isn’t far away). I really enjoyed this read so much; it was refreshingly simple and honest to read, it was not pretentious or verbose, it didn’t take itself too seriously. This story was interesting, it had very likable characters, it has a well crafted and deftly woven plot and it had an ending that all will applaud. Quietly spoken… a powerful voice. For police chaplain Paul Doherty, called to the scene by Senior Sergeant Boehm, it’s a story that will end as tragically as it began. For this is clearly no ordinary siege. The boy, known as Ali Khan, seems as frightened as his hostages and has yet to utter a single word. And of course there’s Ali Khan. Is he the embodiment of evil, as the villagers in his Tanzanian birthplace believe? Or just an innocent boy, betrayed at every turn, who just wants a place to call home? A very seductive novel –Paul Doherty, the police chaplain, is the narrator, his voice is very calm, reassuring, gentle and non threatening or judgmental. The police chaplain is a great listener- this is how he describes himself ,and he lets the characters of this novel quietly have a conversation they think is just with him; personal, intimate, all revealing and he is a supportive listener; he actively listens and we the audience through reading this book become a silent party to this conversation. I love this device – it is simple and makes the narrative easy to follow and play out in your mind and you feel comfortable listening to uncomfortable things: of refugee camp horror tales, of detention centres crisis, of small minded mean hearted people living small mean lives, of infidelity, and greed and sometimes you hear the voices of hope and love. Slowly and deliberately you are reeled into this story …then POW you are knocked off your feet with the twist and reveal; the death your expecting, the death that seemed an obvious outcome didn’t quite work out the way you were lead to believe it would happen and then there is the twist…so sad. 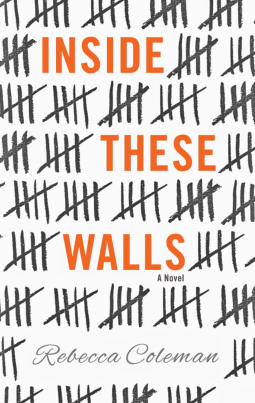 This is a gently written, powerful book that will affect your emotions and will leave you thinking about the bigger issues. One tragic event connects four lives in this haunting story of loss, love and renewal. Burned is the winner of the National Seniors Literary Prize 2013. Four people, from opposites sides of the world, are about to be brought together by one horrifying event that will burn them forever. This novel provides an interesting and thought provoking discussion on a number of issues – including a major contemporary issue, bullying. Bullying and the effect this has on all those involved, be it that the one doing the bullying, the bullied, those in the immediate vicinity (family, friends, colleagues) and those on the periphery; communities as a whole including school teachers, police officers etc. It is a big issue with huge ramifications for all those scorched by this touch and this book admirably demonstrates the extent of the influence one person can make to the lives of so many. This is a story that delves into many issues; death is paid particularly attention; death of a child, death of a parent, and death of a love affair, death of a relationship. Death impacts on those in the immediate vicinity and those in the surrounding in many and varied ways. Some cope and move forward, for some lives are negatively impacted and forever changed. But this is not an altogether negative book; it is a book of hope (for some but not all) and ultimately a book of new beginnings. I particularly enjoyed the sections of the book that dealt with Kate and her affinity with the ocean. They are some beautifully evocative descriptions of the ease she felt with and the restorative nature of the ocean.